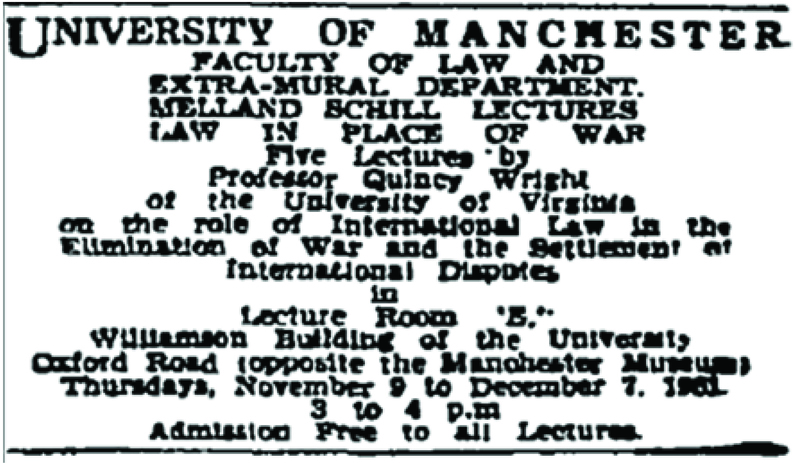 In partnership with the School of Law and Manchester University Press, the University of Manchester Library has recently digitised the renowned series of Melland Schill lectures on International Law. To officially launch the series the noted barrister and member of the UN International Law Commission, Sir Michael Wood, will be outlining their importance at a special event hosted by the Manchester International Law Centre on February 1st. The first series of 5 lectures were delivered in the first week of May 1961 under the heading “Europe in Action” by Arthur H. Robertson who surveyed “the modern manifestations of the European idea.” Some of the topics he addressed remain matters of perennial legal interest – particularly the “new” European Commission and the Court of Human Rights – whilst other areas touched upon – “the Coal and Steel Community” – serve to remind us of some of the original drivers for European Union. Revealingly the foreword to the collected volume, printed as The Law of International Institutions, outlines the historic context and strong social motivation behind this innovative series of lectures. 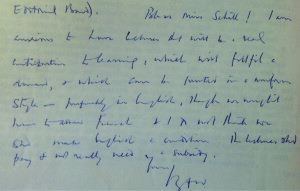 The funds for the lectures come from a 1958 bequest by Miss Olive Schill, who after a brief period working for the BBC as organiser of the North Region Children’s Hour, served as the first Secretary of the Manchester University Appointments Board from 1936 until her retirement in the early 1950s. Her grandparents had moved to England from Wurtemberg, and her father chaired a Manchester-based export merchant company with global interests: Messrs Schill Brothers. A Cambridge History graduate, she demonstrated a lifelong interest in social causes from the 1920s onwards and sat on a diverse range of committees. These extended from what might be reasonably expected for the standards of the day: the National Council of Women and the Gentlewomen’s Employment Society (another beneficiary and for whom she worked for 34 years), to the more surprising – the Miners’ Welfare Grants Committee and a price-control committee investigating cases of black-marketing. 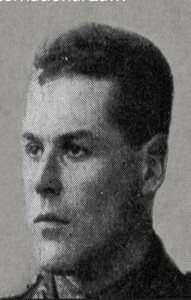 Her elder brother, Edward Melland Schill, had also studied history, but at Oxford where he obtained a First, and after a short time working for the family business, enlisted in the Autumn of 1914. Promoted to Lieutenant in April 1916, he left for Flanders that June, and died there “of wounds,” two months later on 24 August at the age of 25. Later that year, in a letter to the Vice-Chancellor, Sir William Mansfield Cooper, Ben Wortley, Professor of Jurisprudence and International Law at the University, welcomed the bequest as a means to “make a splendid memorial to Melland Schill” and to satisfy “a crying demand in every country in the world, in official and non-official quarters, for first rate works on burning topics of and international law by authorities of the highest quality.” In a classically indecipherable academic hand he concluded with an outline of what would be the guiding principles behind the project. 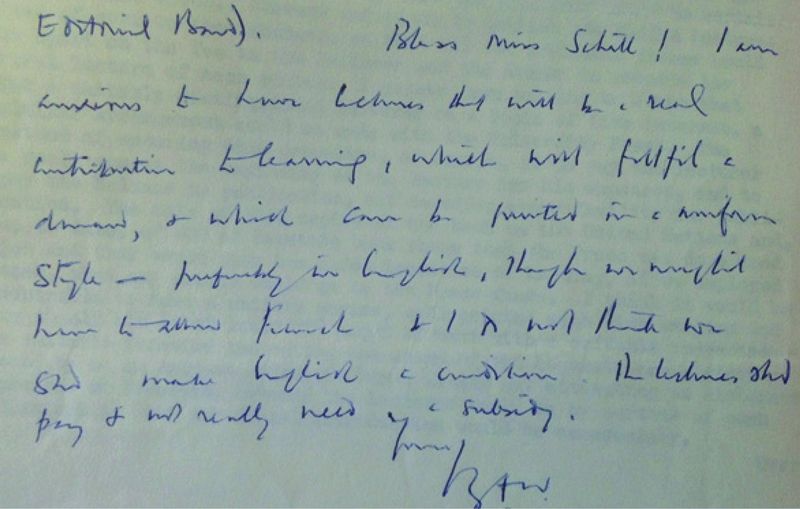 Wortley would be the guiding light behind the Schill lectures until his retirement in 1975 when the series was extended in scope to become a stand-alone series of monographs. This first iteration (1961-1974) of the lectures comprised a set of five delivered annually by an expert in the field, with publication (ideally) timed to coincide with the delivery of the first lecture – a tight schedule that often tested relations with Manchester University Press who undertook their publication – and of course continue to do so today. The clarity of the layout and quality of the print established from the outset has also played no little part in ensuring that the 300 dpi digitisation of these resources undertaken by the Library has been such a smooth process. Those attending the address by Sir Michael Wood in February will learn more about some of the eminent individual contributors to the series, but it is clear that the vision of promoting comprehension of international law and thereby implicitly minimising the possibilities for future conflict (through shared understanding and tolerance) inherent in the bequest was readily understood and notably enacted by the choices of both topic and lecturer made by Wortley. His Times Obituary immediately flags that “His utterances were marked by a strong insistence on the moral basis of international law” (Times Tuesday June 13 1989 p.20) and it is clear that the continued relevance of the series – and of course the now satisfied demand to extend its availability – is down to that ethos. The Manchester International Law Centre’s decision to revive the Lectures last year – commencing with Professor John Dugard (Universiteit Leiden) posing the question “Are Existing States Sacrosanct?” – also springs from the same impulse as its forthcoming programme of events makes evident. 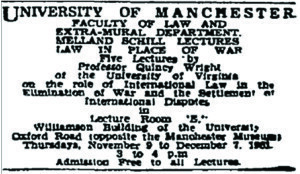 Although at first glance some lectures do look largely historic – perhaps exemplified by the 1967 series “International Law and the Uses of Outer Space” (to which Wortley extended a personal invitation to his Manchester colleague, Sir Bernard Lovell with the encomium that “Fawcett’s lectures are really up to date, and, in addition to showing a magnificent grasp of the legal side, appears to be very conversant with astronomical terminology”) – the majority address wide-ranging questions whose continued relevance remains all too apparent. Issues relating to “The Acquisition of Territory in International Law” and “The Role of International Law in the Elimination of War” have lost none of their currency and urgency today. They also of course dovetail with the University’s longstanding commitment to social responsibility which has been recently restated as one of its core goals in its 2020 agenda. Hosted by Manchester eScholar, the digitisation undertaken by the University of Manchester Library now extends free and immediate access to that ‘well equipped library’ for a research community of students, academics, practising lawyers and legal advisers around the world, aptly fulfilling the international remit of the humanitarian legacy that established the series from its outset.